These tacos are a great vegetarian alternative to meat filled ones, not to mention they are also naturally gluten free. 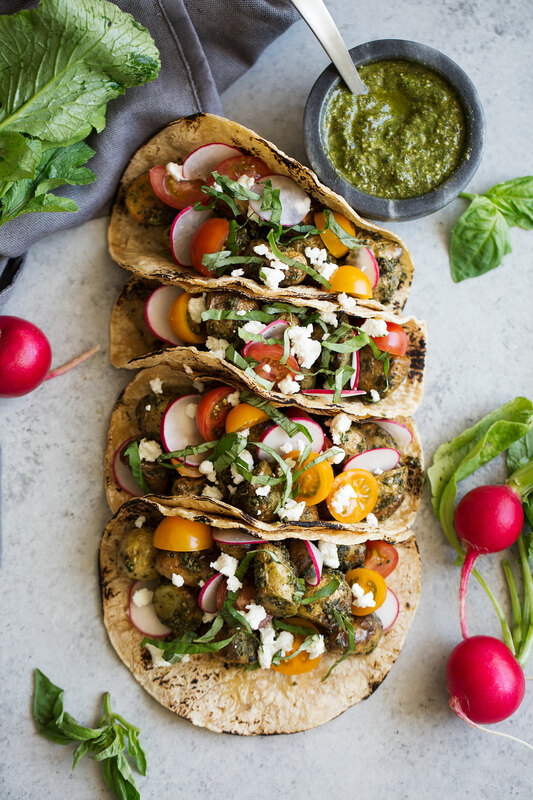 The potatoes are roasted until they are crispy on the outside and tender on the inside before being tossed in basil pesto and served with crispy radish slices and creamy goat cheese all piled into corn tortillas. I’ve partnered up with Blue Moose of Boulder and TheFeedFeed to bring you this new recipe! Blue Moose of Boulder’s pesto is great because it gives you just the right ingredients – only basil, Parmesan, olive oil and pine nuts – each batch is hand-crafted with no preservatives. Sometimes I don’t have the time or patience to make my own and this pesto is just as good as homemade! If you have a nut allergy they also have nut-free pesto that can be substituted without compromising on the flavor. Fingerling potatoes are a highly seasonal ingredient and start to come to market right about now through mid summer - and are known for their papery thin skins - which yet add another layer of making these tacos great for a BBQ & terrific alternative to the standard BBQ grilled meats. They are also a great make-ahead item so that you can enjoy time with guests. I don’t know about you, but I’ll be for sure making these by the dozen for our Memorial Day Cookout! Also, be sure to check out the giveaway that TheFeedFeed is running next week with Blue Moose of Boulder! Recipe Headnote: Feel free to swap the potatoes for grilled shrimp, chicken, skirt steak of any other protein of your choice! Preheat oven to 400º. Toss the potatoes in the olive oil and spread in an even single layer on an aluminum foil-lined baking sheet. Season with salt and pepper and roast until golden brown and crisp, about 35 minutes. Add the roasted potatoes to a medium mixing bowl and toss with the pesto. To serve, scoop potatoes into tortillas and top with tomatoes, goat cheese, radish and basil. Serve immediately. This post was created in partnership with Blue Moose of Boulder and FeedFeed - all opinions expressed are my own.